In response to the refugee crisis in Europe, Germany welcomed more than 1 million asylum seekers in 2015. With the deployment of an Ideas Box in Düsseldorf, Libraries Without Borders (BSF) helped provide resources to support the local effort of adaptation and integration of the new-coming populations. Hosting 1.2 million refugees in 2015-2016, Germany provided an example as a member of the European Union. German authorities heavily support nonprofit organizations working with refugees thus providing a better support upon arrival in Germany. The capital of the North-Rhine Westphalia State, Dusseldorf receives more than one out of every five of these newcomers in Germany. 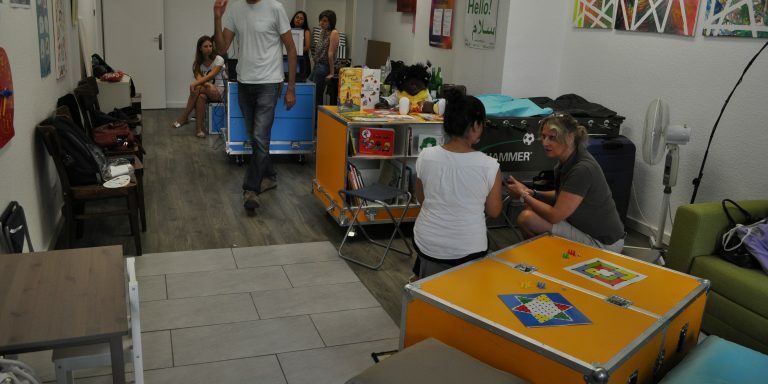 Serving as a media and sharing place between the refugee community and the residents of Dusseldorf, the Ideas Box makes it especially easy to set up activities that are both enjoyable and creative in order to facilitate the process of adaptation and integration of refugees in a manner that is both professional, educative and social. The Ideas Box also created a dialogue between students and refugees concerning stereotypes and prejudices. This ultimately led to the development of a giant graffiti using the photo editing devices and software from the Ideas Box. The graffiti showed how refugees viewed Dusseldorf, thus publicly demonstrating that the integration process had been both collective and personal !